Manic Motherhood » Blog Archive » Apparently, I’m not a domestic goddess. Or organized. Who knew that there was a right and wrong way to fold your towels? Other than Martha Stewart or a drill sergeant, of course. I mean, until that moment I thought everyone on the planet (other than Martha and the aforementioned drill seargeant) rolled their towels into balls and shoved them into whatever cabinet in the bathroom had space. But after that I began to notice little things. Like how I had to duck and hide my face whenever I opened the upper left cabinet above my desk for fear that the shoe-shaped tape dispenser would jump out and poke me in the eyeball. Or how I had to climb a stepladder, move various large, unused pots and a pile of yellowing newspaper recipe clippings to get to the popcorn maker. And that’s when it occurred to me that perhaps, just perhaps, I was a teeny bit disorganized. Also? I have a lot of junk. So I started the New Year with a new organization plan. Out with the old and in with the new, right? And besides, how difficult could it be to reorganize my entire house? Turns out, it is very difficult. I started with the linen closet. I pulled everything out. And by everything I mean I pulled out 3 yellow candles in the shape of turkeys, 27 Christmas kitchen towels in varied states of cleanliness (yuck), numerous kitchen towels for other holidays including, weirdly, Arbor Day (embroidered with the slogan, “plant a tree for life on Arbor Day”), a set of “Die Hard” DVDs, 4 incomplete sets of sheets for twin beds (we don’t own any twin beds), a plastic pink flamingo drink holder, 7 bath towels and approximately 582 lotion and shampoo bottles liberated from hotels. Yeah. I might have a tiny hoarding problem. But I’m working on it. Once I got rid of everything but the plastic pink flamingo drink holder and the towels (please, I have standards), there was a ton of room in the linen closet. I was tempted to also keep the Arbor Day towel, but I resisted. This was a new year and a new me. And I was emboldened by this success to conquer the worst part of my house. 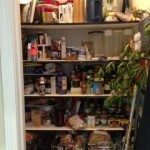 Oh, the pantry. I remember when we moved into this house. 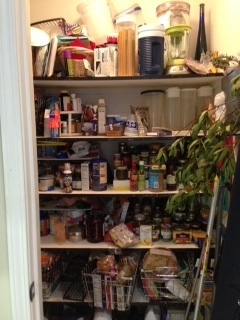 The pantry was new and smelled all fresh and clean. And I had plans for the pantry. I was going to use it to dry herbs. And store food in baskets. In reality, my pantry has become just like my linen closet, filled with Tupperware that hasn’t been used since 2003, a giant Margarita machine, appliances that are supposed to be to mix vast quantities of cake mix and/or bread dough or slice an entire side of beef, enough paper plates and napkins to last through a complete failure of the dishwasher to ever wash dishes again, dog food, dog treats, a giant branch from a bay leaf tree, baggies of soy sauce from Panda Express and Harry’s hot sauce collection, which takes up three shelves. Oh, and some food. So I started hauling all that stuff out of the pantry. And in the back I found a bottle of pink Margarita mix that was about to expire. So I made Margaritas, because you know, I totally needed to make sure the Margarita machine still worked before I decided to throw it away, right? And after a couple Margaritas, I decided I really needed all the stuff in the pantry and who cared if my towels were folded wrong? So I stuffed all the junk back into the pantry and had another Margarita. And thus I started the year with a new me, new attitude. And a slight headache the next day. But at least I’d found the aspirin in the pantry and had the foresight to place it front and center, right beside the hot sauce. Who says I’m not organized? *Yes, I noticed there is a giant tree branch hanging in my pantry. It’s from a Bay (leaf?) tree and I don’t know what use it serves except to hit me in the eyeball every time I try to find the dog food. I need to do a little organizing too. A margarita sounds like a good way to start. OMG Laurie – I just went through my tupperware trying to figure out how to organize it – I have lids in a box on the living room floor and the containers in another box on the living room floor – I can’t REALLY organize it until every single piece of tupperware I have is clean – that is NEVER going to happen – it is going to be sitting on that living room floor for ever. I’m starting to worry about it……. @Jennifer in Reno, LOL don’t you hate that? I know exactly how you feel. If they aren’t all clean, what is the point? You can’t make sure everyone has their lid and you can’t make sure there’s enough room for all of the tupperware…oh, wait. I’m not helping at all, am I? Um, try @Carpool Goddess’ idea and just start with the margarita. It’ll help.